Exploring the Seven Seas of Eastern Indonesia, all around Komodo, right through the Banda Sea or all the islands of Raja Ampat! Indonesia is a country well suited to offer you a cruising adventure of a lifetime! With its tropical climate, warm waters, staggering array of wildlife above and below the water and stunning scenery, this is the land explorers returned to time and again. Take one of our most popular destinations, the Komodo National Park. The islands this island chain lie in the straits between Sumba and Flores. Separated from those large landmasses by deep water sea straits, the Komodo islands have developed unique wildlife of which the Komodo Dragon is the most famous example. The islands grouped in and around Komodo National Park combine a dramatic wild savannah landscape with white and red sand beaches, blue lagoons filled with fish, and some of the most spectacular underwater scenery in the world. As described in travel guides by natural history experts and film makers, the underwater world of Komodo provides one of the best choices in Asia for divers, snorkelers and underwater photographers. It also boasts countless beautiful deserted beaches, hiking routes, shallow reefs for snorkeling kids and lagoons for waterskiing. Absolutely perfect for families or groups that want to combine diving and beach-fun with a relaxing and comfortable way to spend the school holidays together. 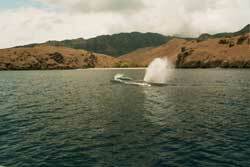 Generally the best season for all-round activities in Komodo is from early April to late October. The rainy season in Komodo begins sometime during the end of the year, and ends around March. Komodo receives very little rain during the dry season from April to October. Dive conditions vary throughout the day, one must really observe and dive with the tide tables to hit every site at the optimal time. Komodo is superb for diving and snorkeling. 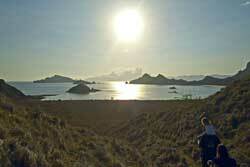 It also offers hikes of 45 minutes to 2.5 hours to see the famous Komodo dragon, wild deer, horses and buffaloes. Komodo's many deserted beaches and hill area provide the best backdrop for your sunset drinks on the beach. Also, the bays where the boat will anchor are often perfect spots for afternoon water-skiing, or a slow cruise with one of the tenders, or kayaks to explore the coastline from the water. For those who want to maximize their time in Komodo, there are flights from Bali to Labuan Bajo on the mainland of Flores, and to Bima in Sumbawa, at the other side of the Park. From one of these entry points you will be transferred to the Seven Seas where you board, take off and enter the Park waters. Alternatives include stepping on-board Seven Seas in Benoa Harbour Bali, and sailing to Komodo National Park in 2 days. Once onboard the luxurious Seven Seas, you will enjoy the beautiful landscape and culture of Lombok, Sumba and Sangean Volcano and be able to indulge in some excellent dives on the way. And don't forget to catch a tuna at Sangean! Another favorite destination is the Raja Ampat island group off the “Bird’s Head” of West Papua. The more than 1,500 islands of the Raja Ampat Archipelago lie at the heart of the Coral Triangle and support the richest tropical coral reef biodiversity recorded anywhere in the World. With a high diversity of near-shore marine habitats, the archipelago encompasses 4.6 million hectares (ha) of largely intact reefs, seagrass beds, mangroves, and rocky coastline, with a low resident human population and, to-date, minimal industrial development. This ecosystem attracts a growing recreational dive industry, and is earmarked by the Indonesian Ministry of Tourism and Culture for future ecotourism development. With this in mind, the government of Indonesia aspires to nominate the archipelago as a world heritage site. There are flights to Sorong from where the cruises start. The Raja Ampat area hosts great mangrove forests and unexplored bays that you can visit with the Seven Seas small fleet of kayaks, and there is an endless supply of picture-book deserted beaches! The area is also absolutely spectacular for its diving and snorkeling. A slow afternoon cruise with one of the tenders gets you up-close-and-personal with the overwhelming land scenery and often allows for spotting of the illusive Bird of Paradise from the water. Hiking into the forest is also memorable. For more serious explorations into the rainforest, the Seven Seas team works with local guides who can help you on your search for mysterious birds and plants. Fishing includes everything you can think possible, from casting lures at Giant Trevallies to deep water trolling for Marlin and Sailfish. And then there is the Banda Sea, for the real adventure cruisers! The Banda Sea is surrounded by islands. From the large islands of Buru, Ambon and Seram in the north, towards Gorom, Kei and Aru in the east, the island of Tanimbar and a series of smaller islands such as Babar and Moa, touching East Timor. These original spice islands, sought for in ancient times by Columbus and Marco Polo, are patched with nutmeg and clove plantations. The Banda islands were once the most coveted destination on earth and have the crumbling remains of Dutch and Portuguese forts that once defended them. The spice islands are known from the old descriptions by foreign traders who fought ocean conditions, disease and each other to get to the valuable spices. The reefs and outer walls of the islands are extraordinary and offer spectacular diving and snorkeling. The islands themselves are a tropical paradise. So many islands and places to visit here! Ambon Bay is host to some of Indonesia's best critter diving. The nearby island of Seram is still largely unexplored and has recently produced some stunning sites. The island of Reong is a small raised limestone island off the NW coast of Wetar. Spectacular walls and interesting critter dives are available near a small creek at Wetar. Here you have a good chance to see resident saltwater crocodiles if you are so adventurous. 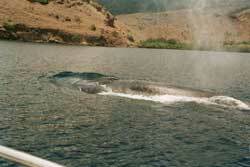 This area is frequently visited by blue whales. Gunung Api is an isolated volcanic peak rising from the heart of the Banda Sea. Surrounded by crystal clear waters this uninhabited island is home to thousands of nesting seabirds. Exuding sulphur both above and below, the water is also home to extraordinary numbers of banded kraits (sea snakes).It is not unusual to have swarms of sea snakes around you while diving on Gunung Api. And have you ever heard of Lucipara?! These tiny atolls in the middle of the Banda Sea are the tops of undersea mountains. The group exists of 5 small islands rising up over a mile from the ocean floor. The uninhabited beaches are ideal green turtle nesting sites. The reefs breathtaking drop off to ocean waters is ideal for diving and snorkeling. A highlight here is night diving with the rare " Photoblepheron bandanensis" or commonly known as "flash light fish". The Banda Sea area has spectacular backdrops with many volcanoes, and beautiful uninhabited beaches for sun-set strolls. 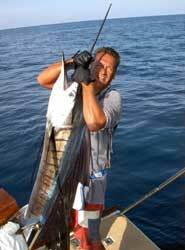 Fishing around the islands in the deeper waters has been spectacular, especially for tuna. Most people however, come to enjoy the combination of some of the best diving and some of the most interesting history and culture. There are regular flights from Bali or Jakarta into Ambon, with a stop in Makassar. Larantuka is the most eastern town on the Island of Flores, and the capital for the East Flores Regency. East of Larantuka is where this adventure takes place. The “Alor Islands”, including a.o. Solor, Adunara, Lembata, Pantar, Alor and Wetar, are located east of Flores in Nusa Tenggara Timor. Kalabahi is the largest town on Alor and the capital for Alor Regency. There are 18 islands in Alor Regency and the area is mountainous as most islands were formed from volcanic activity, which makes for stunning volcano scenery. The waters around the islands are known for their strong currents, particularly in the relatively narrow strait between Pantar and Alor and also between Lembata and Pantar. With each tide, large water masses are pushed through the straits causing strong upwelling. The straits in the area play an important role in the exchange of marine life between the Indian and Pacific Ocean. Each year many whales and dolphins travel from the Pacific and Indian Oceans through the deep but narrow straits in this island chain. These straits have been recognized by scientists as important migration routes for numerous species of whales, some rare and endangered. The island passages between Flores and Wetar seem to be some of the richest in large marine life of all of Nusa Tenggara, and are especially abundant in whales and dolphins. Because of this, coastal communities living along eastern Indonesia's marine migratory routes, especially in the villages of Lamalera and Lamakera have been hunting whales for centuries. Equipped with simple spears, they take only what their village needs to eat and barter only a bit in return for vegetables and rice. The climate is relatively dry with a rainy season is from November -April. The total population on the islands was estimated at 144,629 people or 29,000 households in 1990. There are 14 languages used in the island group, a majority of the people speak Solor and Ende Malay. At present, however, all people are also literate in Bahasa Indonesia. The area is renowned for its abundance and diversity in large marine mammeals, and the whale watching in particularly breathtaking. While cruising through the area, we spot whales surfacing and blowing, and whenever feasible we approach them quietly in the tenders to take a closer look. 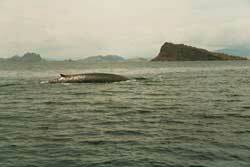 We also visit the traditional whale-hunters and sometimes follow them on a trip, if planned in advance. Close to 20 species of whales and dolphins can be sighted here, a phenomenal diversity, which, combined with the abundance, make this a world-class destination. From tremendous schools of spinner dolphins, hunting together with several species of tuna, to pots of pilot whales, the deep-diving sperm whales and the largest of them all, the majestic blue whale. Also more rare encounters can be experienced here, such as the killer whale or orca, the pygme bryde’s whale, rizo’s dolphins, melon headed whales, and other less known cetaceans. Land trips in the area also include visits to traditional weaving villages and an option to see wild crocodiles on unexplored Wetar Island. 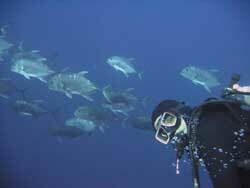 The diving can be spectacular in this area but requires some more experience. Fishing includes trolling and casting for trevally, trolling for Dogtooth Tuna, Spanish mackerel, Barracuda, and yellowfin tuna. The area can be reached by air through Maumere from Bali. Also flights are available to Kalabahi, but less frequent. We would recommend cruises to start in Maumere, after flying in there directly from Bali. The Alor area can also be included in Banda Sea itineraries, between Maumere and Ambon, in either direction. To experience all or just part of the above destinations, we welcome you aboard our luxurious 30 meter-long schooner for your own voyage of discovery. No longer is a journey to the hidden gems of Indonesia's Far East an expedition of certain hardship. We take you there with all the style and comfort you would expect. Sumptuous buffets and a fine selection of wines, air-conditioned cabins and dining room, warm showers, a stereo and DVD will all ensure you feel at home albeit in the most exotic of locations. A variety of activities and facilities are available on and off-board. While anchored at a secluded bay, passengers can take a slow paddle on a kayak or jump aboard the speed boat to explore the beach. Children can play in the waves on a boogie board. Venture onshore to experience some of the local culture and perhaps purchase a beautiful tapestry. Or indulge in a spa treatment or massage offered by our friendly Balinese staff. Divers and snorkelers can choose to hire our equipment and full sets are available. Both wet and dry camera tables have been provided for the underwater photo enthusiast. Special cruises can be organized on request, such as free-diving camps on liveaboard or surfing charters to Sumba, Sumbawa or East Java. The Seven Seas has 8 state rooms with en-suite bathrooms. For the 8 state rooms, 4 rooms host royal size double beds, 2 rooms host a large size single and regular size single, and the last 2 host regular size twin bunks. On the upper deck, the Seven Seas features two shaded sun-decks. 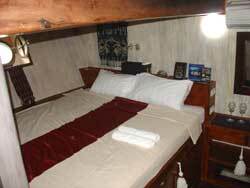 The large sun-deck in front of the wheel house is furnished with 2 large lounge chairs and 2 day beds. It can also be used for outdoor dining. The sun-deck at the rear of the boat features 2 comfortable day beds. On the middle deck, the Seven Seas hosts an air conditioned lounge and dining area, where most of the meals are served. A large working table is available in the lounge for camera preparations and editing work. The open deck in front of the lounge accommodates dive gear and is the place to suit-up for the next underwater experience. 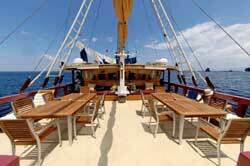 The table in the center of the deck is also used to serve meals, or to study the dive plans. At the bowsprit lookout (a secure netted area in which to sit in) and a special feature of the boat, we allow guests to experience unforgettable encounters with dolphins or just to watch the waves surging by when sailing and enthrall in the joy of sailing. The engine room is the heart of the boat. Its set-up is carefully planned and it accommodates a V8 450HP Mitsubishi engine, two large power generators and one smaller one, two fresh water makers with a capacity of 4,500 liters per day EACH, two Schifauer compressors and an assortment of other equipment, including two extra freezers. Our chef brings years of experience to the Seven Seas. Most of our menus will be offered buffet style. For vegetarians there will be enough choice besides meat, but please mention it to us at time of booking, also if there are other special food considerations. The chef uses as much fresh local product as is available. The bar has a selection of alcoholic and non-alcoholic beverages. Water and coffee and tea are included and for you enjoy as much as you like. Unique and a-first on live aboard vessels, The Seven Seas offers a selection of Spa treatments. The waitresses Jovin and Juli have been trained in Balinese massages and can also perform pedicures and manicures. Spa treatments are provided at the back deck of The Seven Seas. The girls will ensure as much privacy as possible. They use specially selected Indonesian products from famous beauty houses such as Martha Tilaar. visit the Seven Seas Dive and Adventure Cruises website.